Pedro Zamora was 22 when he passed to spirit in November of 1994. He’d already gone public with his HIV status before he joined the cast of MTV’s reality show, The Real World. Still living with my parents, having just turned 19, I watched that show, and ate up every moment, relating to Pedro on a very deep level. He was awesome to me because he was on TV and HIV positive. I watched as he spoke to college students, educated housemates about transmission, and had a commitment ceremony with his positoid partner, Sean Sasser. The Real San Francisco was revolutionary for me- I’d never associated HIV with pop-culture cool before. I’d never considered going public with my own status, either. But, a year and half after the season aired, a Real World Reunion special aired. One of Pedro’s housemates, Judd Winick, spoke out on behalf of his fallen friend. “Do something,” he said in regard to the HIV/AIDS epidemic. The words resonated. 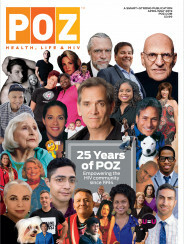 A month later, I launched My Pet Virus the web site, which led to an interview with Poz Magazine. My “roaring 20’s” had started, and HIV- of all things after a decade of silence- was to be the engine for that decade of my life. I never had the opportunity to meet Pedro Zamora, but I did get to sleep in Sean Sasser’s pajamas in ’98 when I was in San Francisco for a Poz Life Expo. (He let me borrow them, don’t get any ideas.) I also met Judd Winick along the way, thanking him for his inspiring words and work on behalf of people with HIV. Fourteen years after Pedro’s death, there are millions of people living with HIV/AIDS in the world, and AIDS is the leading cause of death for young African American women in the United States. Today would have been Pedro Zamora’s 36th birthday. I can’t think of a better day for you to do something. Judd’s beautiful tribute to his friend, Pedro & Me, can be found/ordered at your local bookstore, or here.